Sir Bowie's blog on the origins of Tailgating in America was soaking in along with a few Summer Ales while watching college football Saturday night with Lady Allwinky at Cheeseburger in Paradise. I had a most interesting conversation with a chap sitting next to me at the bar. This gentleman, about my age, was coaxed into going to CIP with some friends. He was from the Westside of Evansville and had never been to the Eastside his entire life! Now I'm not talking about Evansville being New York City, this is a city and metro area of about 160,000. He refused to get something to eat because I quote, "I might like it and I'll want to come back." My first gut reaction was to say to myself, "what a loser". However, I decided not to pass judgement and pursue the course of Unity through Diversity. Being a good Westsider, I knew that we could talk about beer, which then lead to a conversation about how he dry rubs ribs for the grill. But when I left, I was struck by how we, basically social creatures, tend to build walls around our lives, to hunker down with whats familiar and try to keep the strange and new at bay outside our walls. 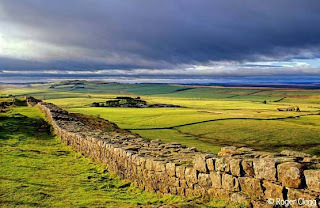 Hadrian's Wall in the northern UK is a prime example of this defensive posture. Built to keep the northern Celts out of Roman occupied England, it was a permanent defensive structure in the field, something rather unique and telling in Roman military strategy. The Romans military strategy, the won that helped them conquer the world, was basically offensive in nature. They would build defensive structures out of earth and wood, but these were always meant to be temporary, just a resting point until the march and bloody slaughter resumed the next morning. It was a relentless machine of death, until it stopped. And stop it did at Hadrian's Wall. The Roman world would never be the same. When I first moved to Evansville back in the late 70's, the city was literally divided by a 2 lane street called Division Street. Railroad tracks ran down it's length right in the middle so it could take between 30 minutes to an hour to travel from the West Side to the East Side. This was enough of a headache to keep people on their respective sides of the "Mental Wall" that was built on Division Street. I lived in the West Side when I first arrived because it was closer to my work and felt familiar to my home town in Southern Illinois. It was there that I learned about German Catholic culture, fish bowls of beer, and to this day some of the finest neighborhood taverns in the city. The rub was, they didn't want to share this culture freely with the uppity Eastsiders. For several years Division Street kept this "Shire" safe from the Dark Lords of the East. Then progress came. More outsiders moved in as industry expanded, universities expanded and the travel situation was finally addressed (but still needs work) with the replacement of Division Street with the Lloyd Expressway. This four lane road meant that travel from Eastside to Westside was cut to between 10 to 15 minutes. The floodgates were opened, the mental walls were breached and the "Barbarians" from the East came pouring in like beer in a frosty fish bowl. So, what's my point in this rambling analogy? The Best Defense is Offense. Defense alone will not win the day. Sure, it might keep you safe for a while, but it is only when you take the Offensive position that you score points, make your point and find the point to your existence on this planet. 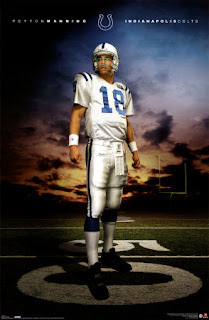 Nothing says good offense these days like an NFL quarterback, a quarterback like Peyton Manning of the Indianapolis Colts. An offensive machine, he is viewed with the same awe as those mighty Roman Generals who marched their Legions throughout the world. NFL football is built on the Roman Legion model. Defense is really offense disguised as temporary defense. It is designed to punish the enemy offense in short order so that their Offense can talk the field again in the shortest time possible to inflict their strategy, score points and demoralize the enemy into submission. These are things you can not achieve while standing behind a wall. Perhaps nothing says disguised offense better these days than the U.S. Department of Defense. It's very name is an oxymoron. 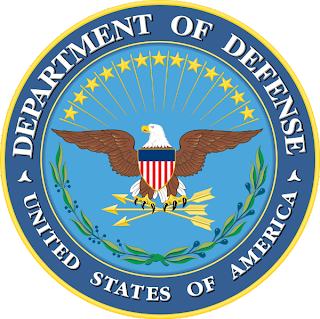 There is nothing defensive about the U.S. Department of Defense. It is an offensive killing machine! It's also offensive to our brothers across the pond as of late because of its miss use by the Bush administration. But what the hell, even Rome had a few nut cases who served as Commander and Chief. The point is we can live our lives either in a defensive position and hope to survive, or chose to be bold and push our boundaries and expand our horizons with an offensive approach to life. It's tough to be free when you've locked yourself into a box or fort (back that match box?). Anyway, getting out of the box -- pushing forward instead of being defensive -- if a metaphor for being free. Part of our motto is "Free to create..." Tough to be free in a defensive box. Freedom to be offensive. Free from our self-imposed limitations, doubts, and fears. Free to choose how to live our lives. Perhaps it's time to look our ego square in the whites of its eyes and charge! Good analogies, and in keeping the guiding principle of "unity through diversity" in mind, staying on offense without being offensive is the key. Not trying to impose our values on people with different values is key, just respect their values. I was struck by former President Clinton's comment during his speech at the DNC that we should "lead the free world by the strength of our example, not by example of our strength". The best line of the whole thing. This has inspired me to go have a cool one at a new bar this afternoon, expand my horizons if you will. Couch Coach Hook has obviously been sat chugging beers and reading his Essays on Football and Philosophy, and an interesting can of worms he jimmied open while he was at it.. This might required some thinking about.. The Roman way of fighting was useless beyond that point in the UK because if you go there...where the wall is built the land changes dramatically beyond it and I can't help thinking that Hadrian knew it was a bridge too far to go and get persistantly slaughtered beyond this point... As for keeping the Picts ( the then scots ) out... the wall was more to stem the raiding parties south of the border than any defense to an invading army as A) the Scots at that time where just a bunch of hairy tribesman...not even clans and had no concept of an army........and B). if they had really been organised properly into an army would merely go round the points where the wall reaches the sea on both coasts. The Scots were happy being in Scotland...and lets face it there was nothing but Trouble and scenery up there anyway, which pretty much sums it up today... Oh and some nice beer. anyway for now i'll agree that being positve when approaching a problem is definitley the way forward... whether thats positve with a cautious defense or a positve all out offense i'll carry on thinking about...that. President Clinton saying that WE should "lead the free world by the strength of our example...? But, I have to agree -- Words without deeds grows a garden of weeds. May they all be positive and loving actions.